Looking for a delicious chocolate alternative? 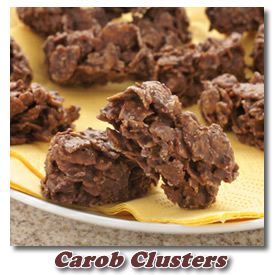 Try Carob Clusters and tempt your taste buds with the crunchy delightful flavor. This is one of the simplest carob candy recipes to make. Give it a try and don't tell the family that it is carob until after they exclaim at how yummy they are. They will probably mistake them for chocolate. One of the nice things about carob is that it doesn't contain caffeine so you can enjoy it even when you are watching your caffeine intake. I've a friend that is 89 years old and she's supposed to avoid caffeine. I personally don't think she really has any problems from it, but that's the latest recommendation from her doctor. Regardless, it's nice to know that she can still enjoy some sweet treats that she doesn't have to worry about. If you are having difficulty finding carob, you can usually locate it in different forms at a local health food store or co-op. You can also order carob chips at Candyland Crafts. They have a large selection of candy making products. I've also included a selection of carob options at the bottom of the page, so you may see something to tempt you. Combine chips and water in a medium saucepan over low heat. Stir until completely melted. Add oats, pecans and coconut, and stir well to combine thoroughly. Drop mixture by spoonfuls onto waxed paper to set. Note: If you would like to enhance the flavor, add a tablespoon of peanut butter to the mixture. Don't be afraid to give this and other carob recipes a try. They really can be quite good. You can find more by visiting our carob candy page or by browsing through those added by other visitors at the bottom of this page. Do You Have A Carob Question or Recipe Idea? If you have a carob question or a yummy carob recipe idea, we want to hear from you. You can share your recipe with other carob lovers by simply filling out the form below. If you've taken a snapshot of your finished sweet, we'd love to see that, too, for inspiration! Click the links below to see contributions and questions from other visitors to this page. You can make your own comments to help or encourage other carob candy lovers.